Years ago, while still living in the city, Carolyn saw an article about an alpaca being used for pet therapy, and thought what an incredible animal! After leaving the city life to operate Cedars Cottage Resort in the country with her husband Doug, the farm beside the resort came up for sale, we bought it immediately to be included as part of the resort. Well, if you have a barn you have to have something in it, something not too big and hard to manage, something easy to care for, and cute to boot. What else could it be but an alpaca! We purchased our first two male alpacas at that time. We halter trained the boys and would walk them through the resort to visit the guests; they were a big hit. After a few months we bought four more male alpacas, the more the merrier. Before long we realized that we were enjoying the alpacas more than the resort. We put the resort up for sale and decided to jump right into the alpaca business. We quickly bought another farm and in one weekend in November 2009 we went from having 6 gelded alpacas to 16 alpacas. We purchased 2 herdsires, and 6 females- 3 were pregnant and 2 had crias at side. We consider November 2009 when we really became alpaca farmers. To keep everyone a bit calmer we knew we wanted to keep our males and females apart; our bank barn wasn't big enough, so we converted the drive-shed into a temporary barn . After almost 2 years the resort was sold and the new barn started going up in August of 2011. By this time our herd had grown to 31 alpacas. Before building visited many alpaca farms in Ontario. We picked up some great ideas and have included them in the design of our new barn, which is where the females and the crias reside. We think our new barn works out very well for the alpacas and us. When we decided raise alpacas we chose to breed for grey Huacaya alpacas. We believe we can breed greys with lingering fineness, density, crimp and correct conformation. Our goal is that each generation will be better than the previous and in time to have a herd of elite grey alpacas. We are now at the stage where we can see the improvements our breeding decisions have made. We have taken advantage of every chance available to us to learn about alpacas. We have attended many Education Weekends sponsored by Alpaca Ontario, shearing courses, Camelidynamics Handling course, and several fibre courses. After much hard work Carolyn is a Certified Classer, one of only a handful in Canada. This means our fibre is properly sorted and classed before going to the mill which will produce a much better final product. In 2010, we participated for the first time at the Alpaca Ontario Show in Orangeville. We entered 6 alpacas in various classes and returned with 5 ribbons, 1st, 2nd, 3rd, and two 4th place ribbons. We were so excited. We still show about 6 alpacas every year and in 2016 we are showing some of our finest greys yet, and we are still very excited. We have entered several fleece competitions over the years and have done very well. Our herdsire Elvis won 1stplace in his class and Overall Winner of the Grey Colour class with a score of 98/100 at the age of 6 years old, beating two of our own alpacas that had scored 92.5 and 89 in their class. We are a very hands-on farm; we feed and check the alpacas at least twice a day. At feeding time, all the alpacas are brought into the barns so we can look them over for any physical and behavioral changes. We clean the pastures and barns daily. We follow a routine herd health program. 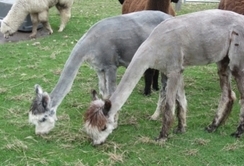 All of our alpacas are halter trained and will walk without difficulty. We pride ourselves on Customer Service. Each client is dealt with personally; we want to sell you what is right for you. 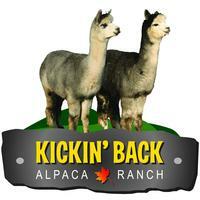 We will help you with ideas to set up your farm for alpacas. We will provide support before and after your purchase. You will be provided with complete records on your new alpaca. Our commitment to you doesn't end with the sale - it is just the beginning. 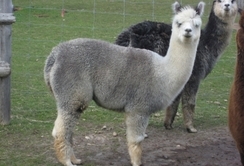 We are a complete service alpaca farm, we sell breeding stock and fibre alpacas, we offer stud services to our top herdsires. We are also qualified shearers. Over the last couple of years we have become more involved in community events to promote alpacas and alpaca products. During the summer months we attend the Collingwood Farmers Market every Saturday morning and the Thornbury Farmers Market on Sundays bringing with us two alpacas, their own pen and tent. We sell beautifully warm hats, scarves, mitts, shawls, socks, sweaters,rugs, yarns, rovings all made from alpaca. We host large farm tours as well as family visits for a fee. We are available for speaking engagements. One of Carolyn's favourite events is Agrication Day for the Grade 3 & 4 students; she attends two of these events each year. Just because the students live in the country doesn't mean they know anything about farming. Carolyn also takes alpacas out to children's events: library story time, Vacation Bible School and for pet therapy to local seniors homes. We also volunteer to man the Alpaca Ontario booth at events like the Royal Winter Fair and the Outdoor Farm Show, helping with the setup for the Alpaca Ontario Spring Show. We are members of Alpaca Ontario Inc., Alpaca Canada, Alpaca Owners Association Inc. and Grey Highlands Chamber of Commerce. Doug is also the Treasurer of Alpaca Ontario.